Saturday November 19th 1881. Weather cold and wintry. I was busy about the house-work a good part of the day, and knit for May my spare time. Rob and I went to the Opera house to a Comic Opera in the evening. Sunday November 20th 1881. I was all the forenoon getting the work done up and in the afternoon read some and talked with Hatt and Flora. Orrie came back this afternoon. I wrote a letter to Charlie in the evening and a few lines to Mr Norris. Weather pleasanter than yesterday. 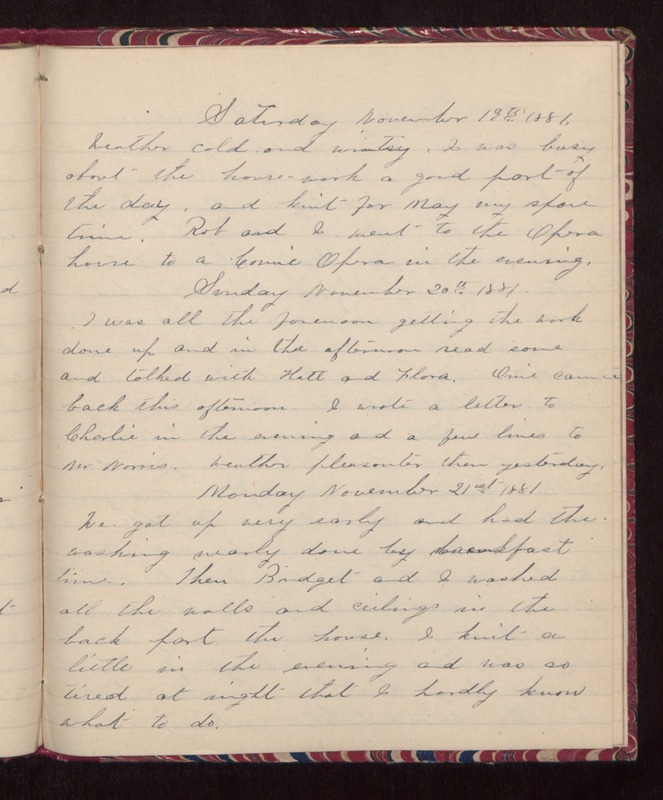 Monday November 21st 1881 We got up very early and had the washing nearly done by breakfast time. Then Bridget and I washed all the walls and ceilings in the back part the house. I knit a little in the evening and was so tired at night that I hardly know what to do.